Here is the gift that we gave our sweet coworker on Wednesday. 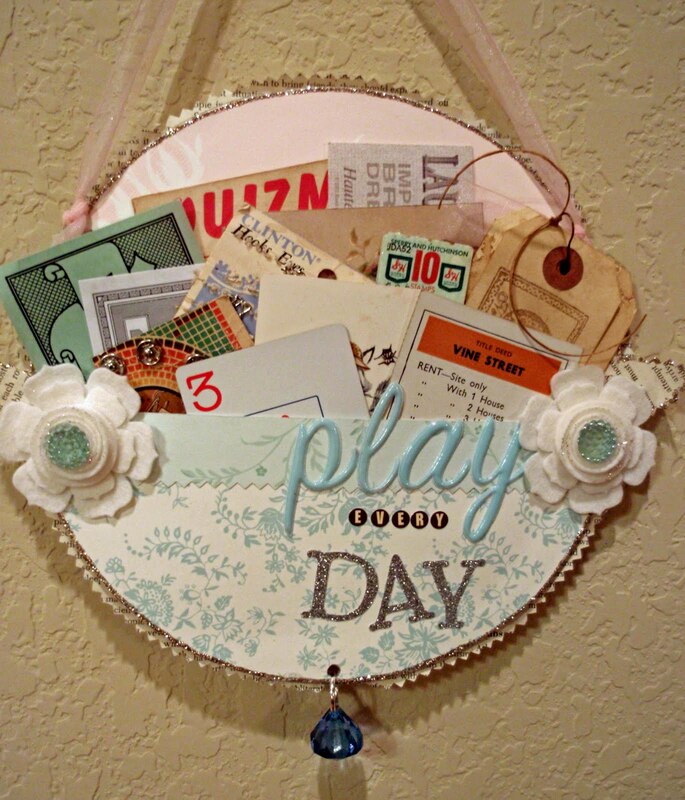 It is just a whimsical wall hanging to remind her that she needs to play EVERY day. A good reminder for all of us I think. 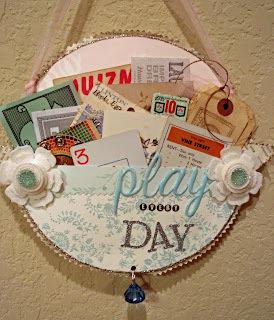 The base is an eight inch chipboard circle covered with the same pink Anna Griffin paper from yesterday's post. Then I created a pocket from coordinating papers. I love a little bit of bling, so I used platinum Stickles around the edge of the circle. Because I love the look of vintage book pages, I decided to edge the base with paper from an old book. I had to tape four pages together to make a square big enough - and then just pinked around the circle. Of course then I had to cover that up on the back. So out came my Martha Steward Circle Cutter and another piece of pink paper. I filled the pocket with all sorts of vintage ephemera. Just some fun reminders of playfulness to gaze at each day. I used various stickers for the sentiment and some sheer pink ribbon for the hanger. And of course a chandelier drop at the bottom. Then came the dies. I made felt rolled flowers from the MFT Stamps Rolled Flower Die, but they just weren't big enough for the piece. So I cut 2 sizes of the Beautiful Blooms II #1 Die Collection from PaperTrey Ink to go under the rolled flowers. Perfect ! I added a resin flower to each rolled flower and called it done. So use your dies to add to decorator items. I am not sure there is a project that doesn't need a flower or two added to it! I'll be back tomorrow with a book review for you.